Ever receive an email with a broken merge field in the subject line? It’s the ultimate personalization fail. 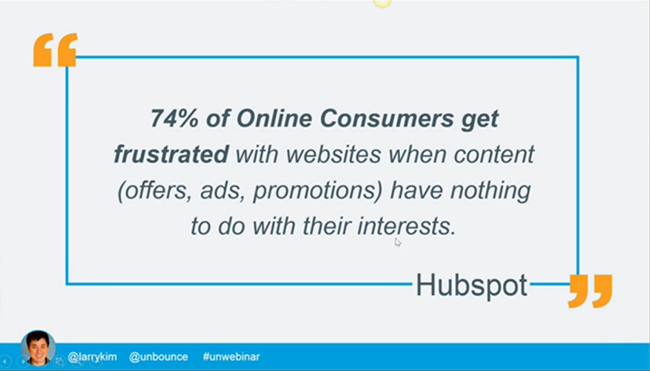 The same goes for neglecting to personalize your pay-per-click campaigns. If you’re not careful, your generic PPC ads could be creating jarring experiences for prospects. And a poor experience = a poor conversion rate. The good news is that personalizing your PPC campaigns is easier than it’s ever been, thanks to a slew of recently released AdWords features. 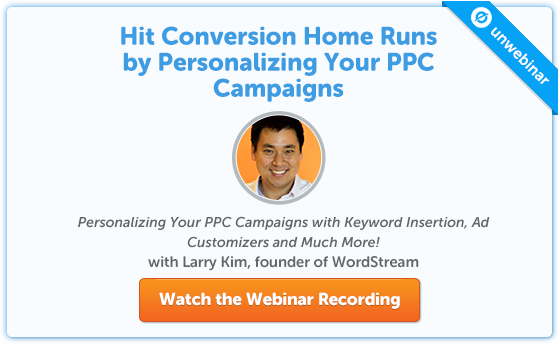 And in our latest webinar, Larry Kim of WordStream shared five of his favorite PPC personalization tactics — magic tricks that won’t make you pull your hare out. 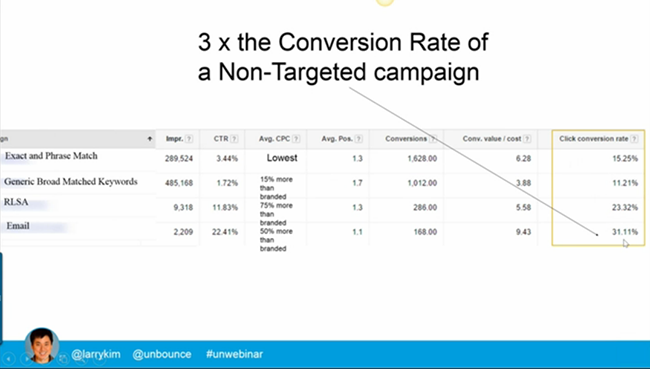 As Larry explained in the webinar, we’re living in the golden era of personalized PPC marketing. For the first time in the history of advertising, you can target ads based on identity. What is this witchcraft, you ask? A little AdWords feature called Customer Match, which lets you upload a list of customer email addresses that you grab from from your email automation platform Then, when prospects are signed into Google Search, YouTube or Gmail (which according to Larry is about 50% of the time), you can serve them up an ad that relates to the list they were in. Have a list of prospects who you opted into an offer for a PPC ebook? Upload that list into AdWords and serve them up an ad about a related offering, already knowing that they’re into learning about PPC. Customer Match works so well because you’re not blanket messaging strangers — you’re targeting people who are already familiar with your brand. But Larry explained that the real magic happens when you couple Customer Match with more advanced email marketing segmentation. 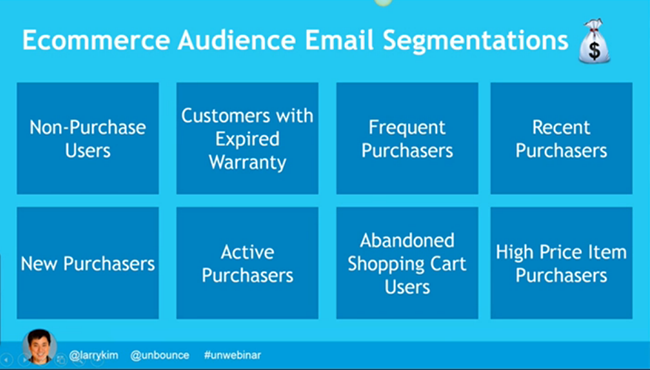 Larry suggested taking those same email segmentations and uploading them into Google Adwords as separate audiences. From there, he explained, you can leverage existing segmentations and offers by sending complementary, hyper-targeted paid advertisements. 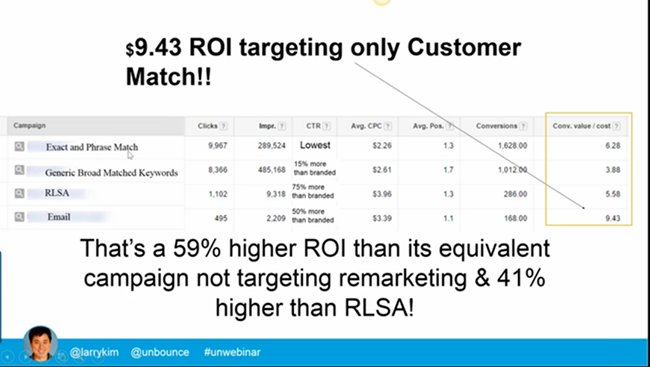 The Customer Match campaign (“Email” in the first column) is generating a $9.43 ROI — significantly higher ROI than any other of the targeting mechanisms. Thinking this seems too good to be true? Well yeah, there is a catch. Larry explained that your conversion volume is going to be low — you are cherry-picking your leads, after all. So to be clear, Larry isn’t advocating that you shut off your primary drivers of conversion volume in favor of this type of cherry-picking. But he is recommending that you experiment with capturing these rare and beautiful clicks. Google has this other really snazzy feature called Similar Audiences which can help you expand your reach by leveraging the success of Customer Match. In a nutshell, Google looks at the behavior, demographics and search patterns of your Customer Match audiences and finds similar people for you to reach out to. It’s an easy way to go after a larger audience of people without having to say goodbye to those sweet CPCs and conversion rates. Customer Match is really only the tip of the iceberg when it comes to personalizing your PPC campaigns. There’s so much more you can be doing to make your prospects feel like you get where they’re coming from and that you’ve got a custom-tailored solution for their problems. 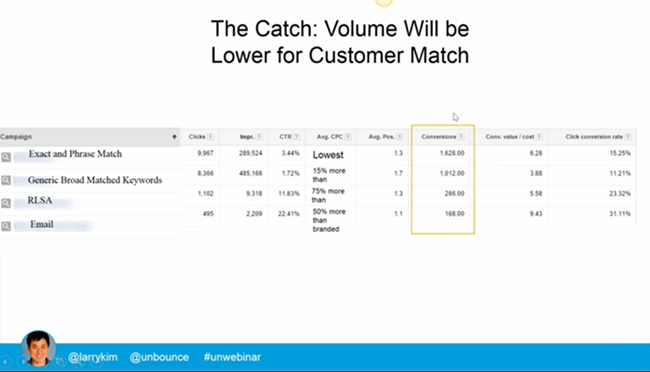 …In fact, Customer Audiences were one of five tips that Larry shared on the webinar.